Juniper schnapps, verjuice, lavender honey. 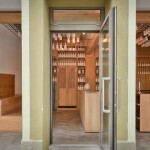 When owner and head bartender Matthew Bax opened Gamsei 2013 in Munich’s trendy neighbourhood Glockenbach, he introduced hyper-localism to a field of practice which had till then been mainly confined to the food scene. At Gamsei, ingredients for cocktails like Lavender Drunk Bee, Mid-Life Crisis and Frühlingserwachen, are either wildly foraged by Bax and his team or grown by local artesian farmers, thus reestablishing a connection with local products, region and culture and offering something that is unique in its kind. Bax, an Australian artist and founder of three bars among which award winning bar Der Raum in Melbourne envisioned his fourth as an antidote to the globalization of cocktail bars; why drink the very same cocktail in every bar you go to in the world? Why not experience the excitement of the new when sipping a cocktail? 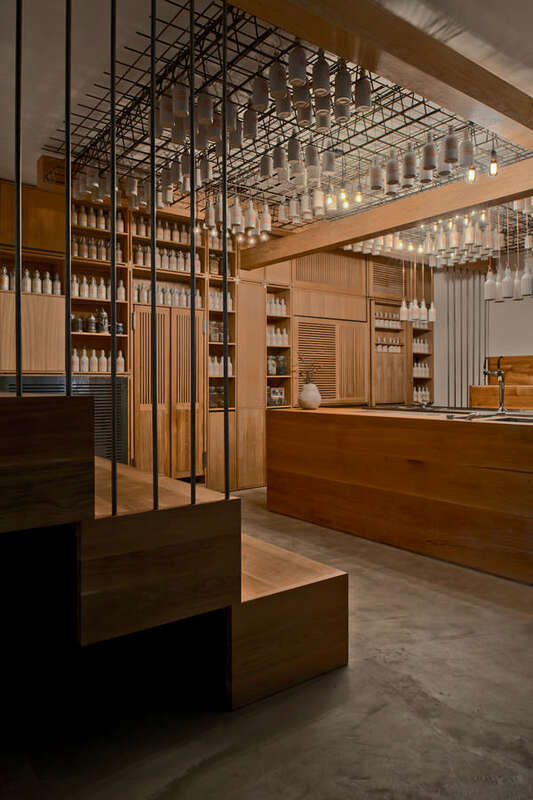 The bar interior, designed and executed by Fabian A. Wagner of Buero Wagner (Munich, Germany) with Andreas Kreft, is a clear continuation of this philosophy – looking for surprising configurations whilst paying a tribute to the local Bavarian culture and craftsmanship. The ambience of a typical Bavarian beer hall has been applied to the 40m² interior through amphitheater-style benches against opposing walls thus eliminating the common separation of bartender and guest, here interaction is key and everybody has a first row seat: from either tribune guests enjoy a view onto the two centrally placed bars and follow how Bax and his team mix, shake and stir up the cocktails. Also the bars have been stripped of all boundaries: workspace and bar are one. 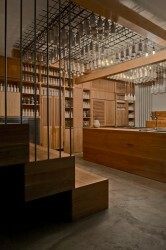 Dried flowers, herbs and leaves are stored and displayed in a wooden built-in cupboard that stretches the full length of the back wall; Besides ingredients, also the coffee machine and even the doors to the bathrooms and laboratory are seamlessly integrated and can be flexibly displayed or disguised behind lattices. 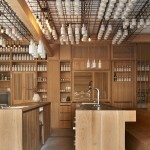 Tribunes, bars and cupboards are executed in solid oak with a natural oil finish. 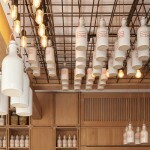 White ceramic bottles are suspended from a black steel mesh attached to the ceiling, which contain self-made liqueurs, syrups and essences, in-between which light bulbs make for a reduced lighting scheme by night. 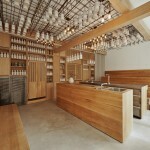 Just like Bax’s cocktail ingredients, Buero Wagner procured all materials such as wood, ceramics (custom-made by Gefäß & Objekt) and steel locally, and worked in close collaboration with local carpenters and manufacturers to produce custom-made solutions. Gamsei is a wholly integrated concept that turns the event of drinking a cocktail into a novel experience. 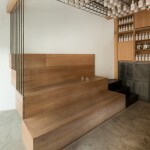 The refreshing take on the cocktail bar extends further: bartenders, dressed in uniform leather aprons, serve their guests an amuse-gueule such as “Biersand”, after taking their coats upon entering, and the tribunes on either side – to be climbed only without shoes – allow for sports broadcasts. Buero Wagner (Munich/Breitbrunn, Germany) was founded by Fabian A. Wagner in 2012. Before he worked with MVRDV in Rotterdam, Netherlands, Baumschlager Eberle and RAD, both in Hong Kong. Buero Wagner’s recent completion is an office interior in Munich, realized in collaboration with Atelier Steffen Kehrle, and is currently working on the regeneration of a listed industrial building. 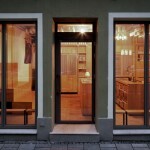 Andreas Kreft is an architect currently working with Jürke Architekten in Munich. Before joining Jürke Architekten, he worked at Studio Daniel Libeskind in New York and Palais Mai in Munich. Together with Belgian designer and artist Arne Quinze (SAQ) he worked on the Bikini Project in Berlin.